Lok Sabha Elections 2019: The total value of Rahul Gandhi's assets was 9.4 crore. The affidavit showed that the Congress chief does not own a car and has liabilities of around Rs 72 lakh. The affidavit showed his cash in hand amount is Rs 40,000. 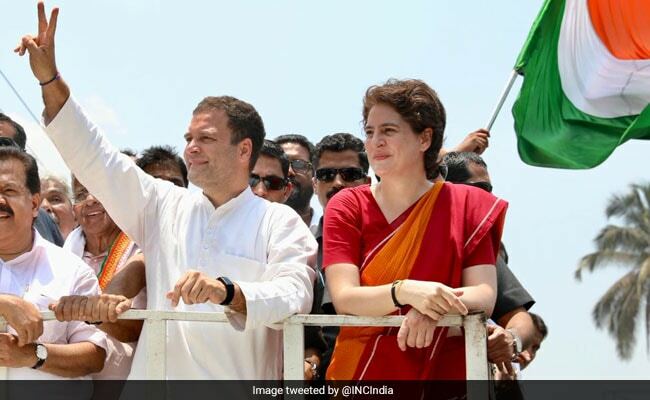 Congress chief Rahul Gandhi's assets rose from 9.4 crore to 15.88 crore over the last five years, revealed the affidavit he filed on Thursday for his candidature in Kerala's Wayanad seat. Ahead of the 2019 national elections, the total value of his assets was 9.4 crore. The affidavit showed that the Congress chief does not own a car and has liabilities of around Rs 72 lakh. The affidavit showed his cash in hand amount is Rs 40,000. Today, accompanied by sister Priyanka Gandhi Vadra, Mr Gandhi filed his nomination at the office of the district collectorate in Kalpetta. The affidavit accompanying the nomination shows his total income for in 2017-18 financial year was Rs 1.11 crore - the sources of income mentioned include his salary as a lawmaker, income from royalty, rent, and investments. Mr Gandhi continues to own a share in a farm he inherited in Delhi's Sultanpur village, worth around Rs 1.32 crore and has purchased two office spaces in Gurugram's Signature Tower in December 2014, which are worth over Rs 8.75 crore. He also owns some jewellery valued at around 2.91 lakh. The Congress chief has declared that he has five cases pending against him, four of which involve allegations of defamation. Under educational qualifications, Mr Gandhi said he has an MPhil degree in Development Studies from Trinity College, University of Cambridge. Mr Gandhi is contesting from Wayanad in addition to the family bastion Amethi in Uttar Pradesh, which he has been holding since 2004. Since the party announcement that he would contest a second seat, Mr Gandhi has been facing BJP taunts. Union minister Smriti Irani, who has challenged him from Amethi for a second time, has said he was "running away" as he was unsure of his prospects. Mr Gandhi said he was requested to contest from a seat in south India and he accepted. The people in the south, he said, were feeling alienated due to the policies of the BJP-led government.